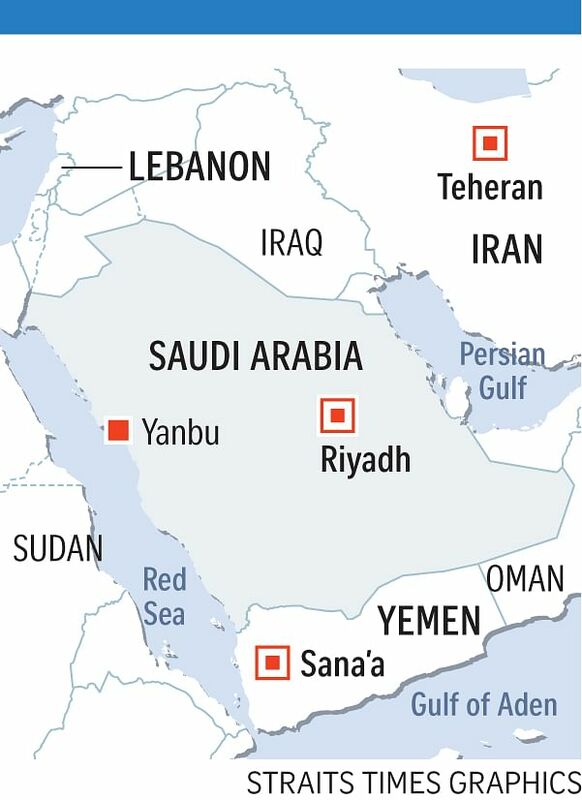 RIYADH • Saudi Arabia's powerful Crown Prince yesterday accused Iran of "direct military aggression" through Yemen's Houthi rebels, in the sharpest escalation in nearly three decades of mounting hostility between the two regional rivals. "The involvement of Iran in supplying missiles to the Houthis is a direct military aggression by the Iranian regime," the Saudi Press Agency quoted Crown Prince Mohammed bin Salman as saying during a telephone conversation with British Foreign Secretary Boris Johnson. Iran has dismissed the Saudi accusations, with an official spokesman saying that Foreign Minister Mohammad Javad Zarif had told Mr Johnson in a phone conversation that "the allegations by Saudi officials were contrary to reality". The Saudi accusation came shortly after a wave of arrests in the kingdom that appeared to complete the consolidation of power by the 32-year-old Crown Prince. Taken together, the two actions signalled a new aggressiveness by the prince both at home and abroad, as well as a new and more dangerous stage in the Saudi cold war with Iran. "Today, confrontation is the name of the game," said scholar Joseph A. Kechichian at the King Faisal Centre for Research and Islamic Studies in Riyadh, Saudi Arabia. The involvement of Iran in supplying missiles to the Houthis is a direct military aggression by the Iranian regime... (and) could be considered an act of war. CROWN PRINCE MOHAMMED BIN SALMAN, during a telephone conversation with British Foreign Secretary Boris Johnson. BEIRUT • Lebanon's Prime Minister Saad al-Hariri, who sparked a political crisis on Saturday by declaring his resignation in Riyadh, has travelled to the United Arab Emirates (UAE), Saudi media said yesterday. Mr Hariri's surprise resignation has thrust Lebanon back onto the front line of the Middle East's most biting rivalry, pitting a mostly Sunni bloc led by Saudi Arabia and including the UAE against Shi'ite Iran and its allies. On Monday, Saudi Arabia accused Lebanon of declaring war against it because of aggression by Iran's Lebanese ally Hizbollah, dramatically escalating the crisis and threatening to destabilise tiny Lebanon. Ratings agency Moody's has said that any return in Lebanon to the political paralysis that existed before Mr Hariri joined a national unity government last year would harm its credit rating. The sudden nature of Mr Hariri's resignation has also fuelled speculation in Lebanon that he was coerced into quitting and has been held against his will. Saudi Arabia has denied this. Mr Hariri, an ally of Saudi Arabia, left Riyadh early yesterday for Abu Dhabi to meet the UAE Crown Prince Mohammed bin Zayed al-Nahyan, the Hariri-owned Future TV and Saudi-owned Al-Arabiya reported. A top official of his political party has said he would return to Lebanon. Former Lebanese prime minister Fouad Siniora said Mr Hariri's return home was "a priority", adding that he had spoken by phone to the party leader on Monday. In the latest flare-up, Saudi Arabia intercepted and destroyed a ballistic missile near Riyadh international airport last Saturday, reportedly fired from Yemen by the Iran-backed Houthi rebels. In an interview with CNN television on Monday, Saudi Foreign Minister Adel al-Jubeir accused the armed Lebanese Hizbollah group of firing the missile at Riyadh from Houthi-held territory. He said the missile was similar to one launched in July at Yanbu in Saudi Arabia and was manufactured in Iran, disassembled and smuggled into Yemen, then reassembled by the operatives of the Iranian Revolutionary Guards and Hizbollah, and "then it was launched into Saudi Arabia". It was the first reported Houthi missile to reach Riyadh, with smouldering debris landing inside the King Khalid International Airport, underscoring the growing fallout for Saudi Arabia from its involvement in neighbouring Yemen. Saudi Arabia has put a US$440 million (S$600 million) bounty on the heads of 40 Houthi leaders, including rebel leader Abdulmalik Al-Houth, following the attempted missile strike. Individual rewards ranged from US$5 million to US$30 million. The kingdom has led a military intervention in support of Yemen's internationally recognised government since 2015 during which more than 8,650 people have been killed. Prince Mohammed, who is also Defence Minister, is seen as a key proponent of the intervention. The missile attack could escalate the proxy conflict between Riyadh and Teheran, which back opposing sides in wars and power struggles from Yemen to Syria. The coalition sealed Yemen's air, sea and land borders, saying they were being closed to fill the gaps in inspection procedures that enable "smuggling of missiles and military equipment to the Houthi militias". The coalition has imposed severe restrictions on all deliveries of goods to rebel-held areas of Yemen since the start of its intervention, allowing in only UN-supervised relief supplies. New York-based Human Rights Watch said yesterday that the missile launch was "most likely a war crime" but urged Saudi Arabia against restricting aid access to Yemen, where the United Nations estimates some seven million people are on the brink of famine and nearly 900,000 infected with cholera.